Using a wireless podium mic allows lecturers to move around freely as they present their material, rather than being limited to standing directly behind the lectern. 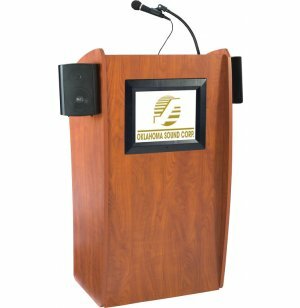 The Vision Media Lectern combines a beautifully crafted traditional lectern with a 15" LCD screen. Display a logo from your school, church or hotel, or highlight presentations with photos, diagrams, and anything else you need for your presentation. Just upload images in JPEG, MPEG or MP3 fomats with a SD–card or flash drive, and they are ready to be displayed for the audience. The 30–Watt amplifier is powerful enough to address an audience of 900 people. 1⁄8" audio jack enables you to connect to any digital media. Comes fully equipped with wireless mic, wired handheld mic, wired tie–clip mic, and two detachable speakers. 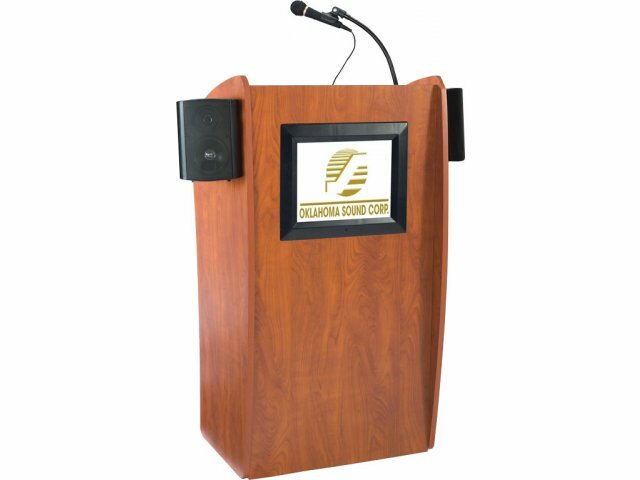 Visually Highlight Presentations: LCD screen in lectern lets you display images and project sound during presentation. Features image intervals in slide-show mode. Single Touch Operation: Switch between preloaded images with the touch of a button. Elegant Appearance: Designed with a sleek curved shape in a modern cherry laminate. 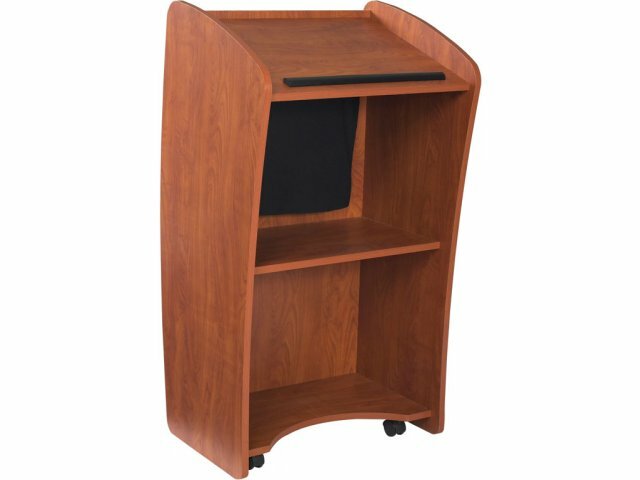 Convenient Storage: Adjustable shelf (21–27"H) and bottom shelf provide ample storage. Easy Mobility: Concealed casters make it easy to move lectern. Power Supply: AC power cord included. 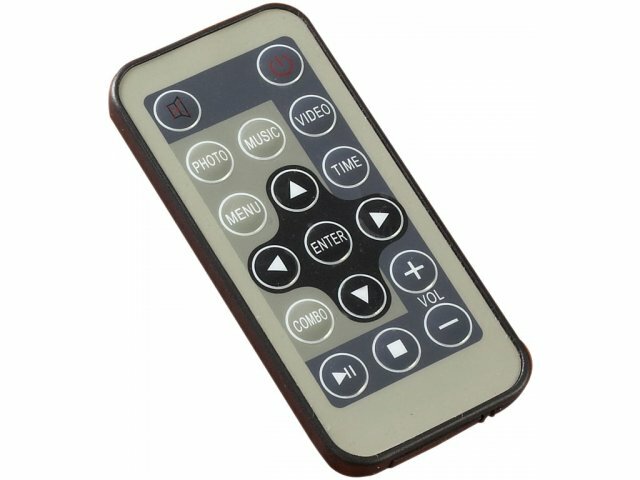 DC Port included for optional battery packs such as Tekkeon MP3450i or similar. Powerful Sound: 30–watt amplifier can reach audiences of 900. All Inclusive: Sound package includes a wireless mic of choice, wired tie–clip mic, wired handheld mic, and two detachable speakers.